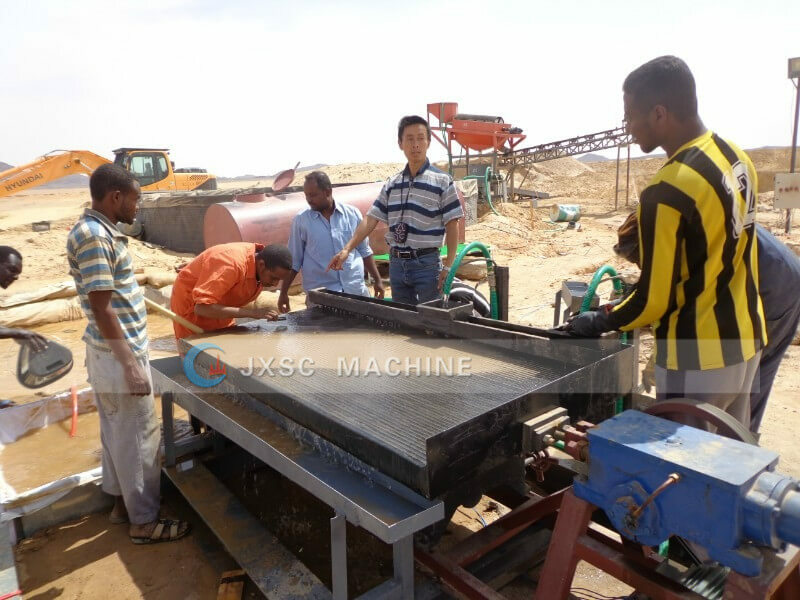 JXSC provided a full set Alluvial Gold Mining Equipment for our Sudan customer. This gold wash plant is 20TPH input process capacity, the raw material is the sand type, without sticky clay, can wash clean easily. gold size is very small fine. We have designed the most effective processing flowchart according to customer’s ore conditions, provide full set gold mining equipment, and send our engineer to customer’s mine site for equipment installation and commissioning guidance. 1) 1 set trommel screen: for washing clean sand and sieving out some bigger particles. 2) 1 set gold centrifugal concentrator: the undersize slurry from trommel screen will go to this centrifugal by gravity, for primary concentration of gold. 3) 1 set small gold shaking table: the concentrate ore from the centrifugal machine will go to shaking table for final separation, then can get very pure gold. 4) 1 set belt conveyor: for transfer away bigger particles. 5) 1 set gold sluice box: for recovery tailings that coming from the gold centrifugal concentrator. Can get some gold from the tailing. Gold ore content is very low, in order to extract gold, alluvial gold mining equipment need to broke ore and grind it, and pre-enrichment from the ore to separate gold. It will create favorable conditions for flotation and cyanidation process, improve beneficiation index and increase total recovery of gold. Gold separation equipment used in the main equipment is knowing groove, shaking, Jig and cone cyclone, etc. 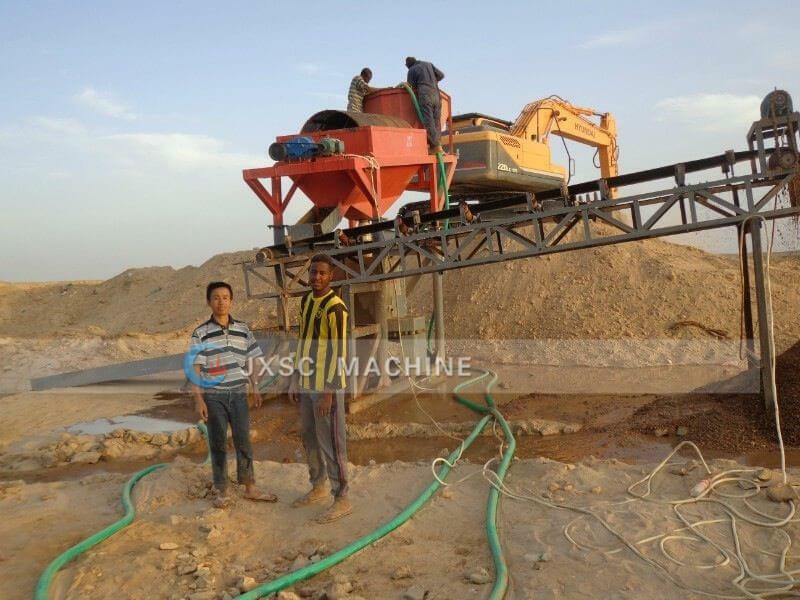 JXSC provide the alluvial gold mining equipment capacity as per requested from 5TPH to 200TPH even bigger, recommend the most effective washing and separation machines as per customer’s gold ore conditions. 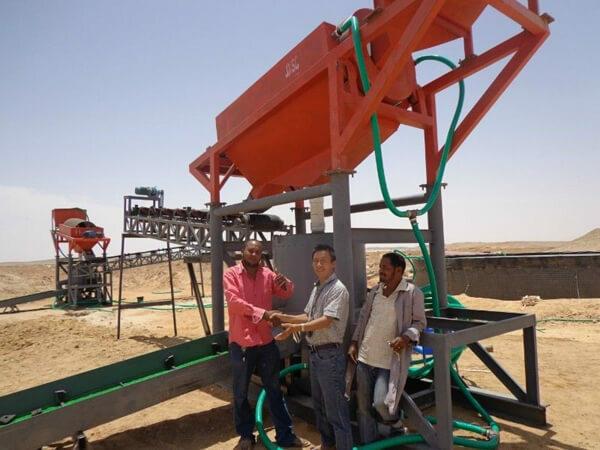 To create more accurate, reasonable, eco-friendly sand gold equipment. Research and development of gravity placer gold equipment, can adapt to the place of minus 50 degrees, gold recovery rate up to 95%, suitable for granular gold, flake gold.